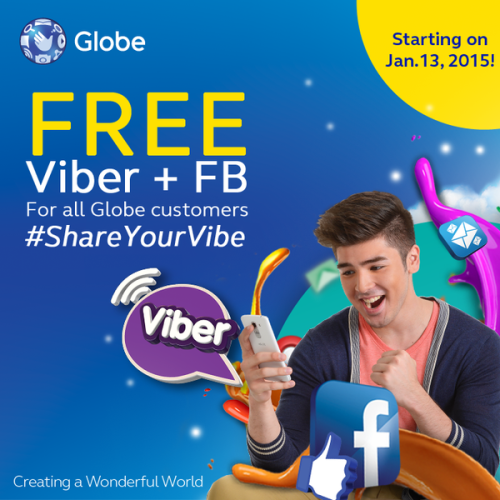 Globe Telecom‘s Free FB is back and now it comes with Free Viber. Globe Telecom Chief Operating Advisor Peter Bithos invites you to #ShareYourVibe this 2015. Here’s an exclusive Kadayawan offer for Globe subscribers. When you get a Cloudfone bundle or handset from Globe, you also get the chance to meet Xian Lim. Get the Cloudfone with the Globe Best-Ever mySUPERPLAN for this exclusive offer. To celebrate it the Kadayawan Festival and its success in Davao region, Globe Telecom has avery special exclusive offer. From August 1 to 15, 2013, Davaoenos who avail of a Cloudfone 352g and Cloudpad bundle at Plan 499 with the Best-Ever mySUPERPLAN will get a chance to win an exclusive Meet and Greet session with Globe and Cloudfone endorser Xian Lim. Did I mention that the Cloudfone 352g and Cloudpad are free at Plan 499? Globe subscribers can choose from other Cloudfone handsets bundled with any Globe postpaid plan. Just apply for a Best-Ever mySUPERPLAN bundled with a Cloudfone at a participating Globe Davao Store in Ayala Abreeza, SM City Davao, SM Lanang Premier or Gaisano Mall Davao. And wait for the approval of the postpaid plan application. Upon approval of a postpaid application, the subscriber is given the chance to pick a prize. Major prizes up for grabs are passes to an exclusive Meet and Greet Session with Xian Lim and copies of Xian Lim’s autographed “It’s So You” CD. Minor prizes are Globe premium items. Twenty (20) winners will be chosen per participating Globe Store to have the privilege to join the meet and greet with Xian. That’s a total of eighty (80) lucky winners. All from Davao. Forty (40) winners will each win a limited edition autographed CDs from Xian Lim and one hundred (100) winners will win Globe premium items. Get that Cloudfone bundled with the Globe Best-Ever mySUPERPLAN now for an exclusive chance to join the meet and greet with Globe and Cloudfone endorser, Xian Lim. Globe Best-Ever mySUPERPLAN is a next-generation postpaid plan with fully-customizable plan components, a plan value almost twice the value of prepaid load, and more contract periods to choose from, ranging from 6, 12, 18, to 24 months. With the Best-Ever mySUPERPLAN, subscribers get the ultimate flexibility in creating a postpaid plan that best fits their needs, lifestyle, and budget. To know more about the Best-Ever mySUPERPLAN, visit www.globe.com.ph/postpaid or call 730-1010. For inquires and questions, you may ask via Globe’s social media accounts: @talk2GLOBE on Twitter and www.facebook.com/globephon Facebook. On Valentine’s Day, Globe Prepaid brought back their Immortal Txt and Call Promos. Watch this video by Ms FunnySexy to know how it works. Registration to Unli Tingi is available from 7am-9am only. These promos are exclusively available for registration by dialing *143#, the newest and the easiest quick service menu from Globe that allows subscribers to register. Other features of *143# include billing and load details, complete list of Globe promos, GCash and Share-a-load services, and download of applications. Globe Telecommunications is proud to be the first telecommunications company in the Philippines to offer customer service assistance in Visayan. Globe’s customer hotline service is now trilingual with the launch of the Visayan interactive voice response (IVR) system. Visayan-speaking Globe subscribers can call 730-1000 from any landline or 211 from any Globe or TM mobile number. Visayan customers can simply follow the voice prompts to direct them to a Visayan-speaking customer service representative. Whether you want your customer service assistance in English, Filipino, or Visayan, Globe has it for you. And in various channels, as well. So you’re sure to enjoy your Globe, anytime, anywhere… in any languange. Everybody’s all abuzz with the release of the iPhone 4S in the Philippines. Thousands have signed up on the Globe Telecom website to pre-order the iPhone 4. The amount of pre-sold Globe iPhone 4S has exceeded the pre-orders of last year’s iPhone 4. Pre-orders for the iPhone 4S started last December 1, 2011. It will be commercially available this Friday, December 16, 2011.
iPhone 4S is supercharged with Apple’s dual-core A5 chip. This translates to snappy performance and stunning graphics. It ios equipped with a new camera with advanced optics; full 1080p HD resolution video recording; and Siri™. Siri is an intelligent assistant that helps you via voice commands. The highly anticipated iPhone 4S has a reworked cellular architecture complete with dual-mode HSPA+ and CDMA2000 compatibility. With Globe’s 4G technology, iPhone 4S will work with it’s utmost potential. In the Philippines, Globe Telecom was the first to roll-out HSPA+ (Evolved High-Speed Packet Access) to cell sites and base stations. If you want to experience the latest in Apple technology combined with Globe Telecom’s powerful 4G technology, place an order for the iPhone 4S now. Pre-order by logging on to http://iphone4s.globe.com.ph. Fresh from a Bloggers Christmas Party by Globe Telecom, I have decided to revive an old phone and starting using Globe Telecom’s services again. I’m on Globe Prepaid now but I’m planning to get a Globe My Super Unli Plan P499 soon. A lot of my friends have been bugging me to get a Globe link, prepaid or postpaid so they can bug me as much as they can since most of them are using Globe’s Unli services. Let me tell you now my friends that I don’t like talking on the phone too much so don’t expect me to abuse this service, k? I do look forward to connecting with my Globe subscriber friends more. And yes, I will bug them when I have to. Because I can. I’m currently on Globe’s SuperUnli Call and Text and I like that I don’t have to worry about going overboard with my postpaid line’s bill (on another network) or going out of load (in yet another network). Enjoy unlimited texting AND calling to any Globe/TM number for only P150/7 days or P25/day. For more info, text SUPERINFO to 8888 for free. Globe Telecom now has a unlimited texting promotion for their Globe Prepaid subscribers. The promo includes unlimited text messages to all networks for 1 day, 1 hour of mobile internet, and 10 minutes of calls to Globe and Touch Mobile subscribers. All these services for only P25. To avail of this promo, text UALLPLUS25 to 8888. You can now send SMS to Globe Telecom, Smart Communications, and Sun Cellular subscribers from your Google Mail (GMail) account. The GMail-to-SMS service allows Filipinos to send and receive text messages from the Gmail interface to and from Globe, Smart, and Sun numbers. FOR FREE! Gmail users can send a text from the desktop interface directly to a mobile phone via SMS. The process is similar to sending as instant message. The recipient of the SMS can respond to the text message and the response will appear in the sender’s desktop Gmail interface. The message can be stored and archived like any other chat or IM messages. Standard network charges will apply for any communication from the Globe, Smart or Sun phone to the desktop. However, sending SMS from the Gmail Chat to a phone is FREE. And you can also send SMS free to mobile networks in 20 other countries including United States, Kuwait, Saudi Arabia, and Indonesia. The complete list of partner networks is at this link. Type a phone number and a short message into the new SMS box in Gmail’s chat window on the left-hand side of the screen. Contact phone numbers can be stored in the Gmail address book. SMS in Gmail Chat is automatically enabled for Gmail users. If it is not active in your account, you can activate it in Gmail’s settings window. NOTE: As of this moment, every user can initially send up to 50 messages continuously. Every reply back from a mobile phone refreshes the counter by five messages, up to a maximum of 50. Even if you go down to zero, however, you will not be locked out of the system. The counter will increase back up to one 24 hours later. For more details, instructions and troubleshooting please visit http://www.google.com.ph/intl/en/mail/help/sms.html. In its bid to improve the quality and lower the costs of IDD calls, Globe Telecom has forged a partnership with Lebara Mobile. Lebara MoBiles is the leading high quality, low-cost international Mobile Virtual Network Operator (MVNO). The partnership will result in cheaper rates for IDD calls from Europe. The deals will give Globe subscribers better value for their calls to relatives, friends, colleagues, and business associates in United Kingdom, Spain, Germany, France, Switzerland, Denmark, Netherlands and Australia. This partnership aims to better serve the numerous OFWs based in Europe. It also aims to improve services at low costs for Filipinos with relatives and business interests in Europe. This partnership came in the heels of Globe’s Super US Direct service which offers low inbound call rates from USA to Globe subscribers in the Philippines. Globe Telecom is definitely working hard to make sure every Filipino stays connected. Globe has a strong international coverage around the world, offering a suite of international services to over 250 destinations and more than 600 roaming partners worldwide. Visit www.globe.com.ph/kababayan for more details. Department of Education Undersecretary Yolanda Quijano, signed a Memorandum of Agreement (MoA) with Ayala Foundation Co-Vice Chairman Jaime Augusto Zobel de Ayala, Nokia Director for Community Involvement Gregory Elphinston, and Globe President and CEO Ernest Cu to expand nationwide the mobile teaching project “Text2Teach” (T2T). It targets 850 public elementary schools nationwide to be used for English, Math, and Science lessons starting this schoolyear. Staring July, the fourth phase will be implemented, making the T2T program available in Visayas and Mindanao. It also aims to upgrade the 205 satellite schools from the earlier phases. By the end of Phase 3 in August, there will be 555 Text2Teach-enabled schools. This means about 40,000 pupils, and almost 1,800 school heads, teachers and DepEd officials will benefit from the project. Phase 4 of T2T will strengthen the partnership between the companies involved and the LGUs. DepEd regional offices will provide the training for the teachers while LGUs will provide larger counterpart funding for the program. In Phase 4, Pearson Foundation will return to the program to help in developing new downloadable educational materials for English, Science and Mathematics. Text2Teach was launched in the Philippines in 2004. In seven years, it has helped improve the performance of students all over the country. This is possible through the through downloadable Math, Science, and English educational videos using Nokia mobile phones and Globe internet connection. Utilizing the power of mobile technology, students in Grades 5 and 6 are able to watch any of the almost 400 educational audio and video materials loaded in the Nokia N86 8MP phones and equipped with the Nokia Education Delivery (NED) application. NED allows teachers to download and easily access educational audio and video files on Math, Science and English. These are designed for the project with the aim to provide highly effective visual aids for teachers. NED also creates an interactive, student-focused learning environment in the classroom which makes the students eager to go to school. Aside from the NED technology, Text2Teach recipient schools also get a Globe SIM card provided with P150 worth of free pre-paid load monthly for one year, a 29-inch colored TV, 3-day teacher training and teachers guides. Current recipients testify that the tools provided by the T2T project help in the performance and attendance the the students. Congratulations to Globe Telecom, Nokia, and Ayala Foundation for a laudable project!